Are you ready to be dazzled? Check out these 12 awesome spring wedding ideas that you can use for your ceremony and reception this year. Your wedding. The big day. Aside from nailing the I do’s and not tripping over your dress on the dancefloor, what’s on your wish list now that you’ve started planning the occasion? All your family and friends in attendance, no holidays or double-booked dates? Check. Your dream venue, that superstar photographer and your other half’s favorite band all available on the same date? And at a discounted rate too? Check. Plenty of public holidays to plan your bachelorette party and honeymoon around? Check! This, young bride-to-be, is the beauty of having a spring wedding. The season doesn’t only bring these amazing practical benefits to your wedding day. It’s also a symbol of new beginnings, representing your love and the start of your married life. Read on to find out which spring wedding ideas will make your day unforgettable, for you and your guests. Who doesn’t love a garden party? Plan your spring wedding in a gorgeous outdoor setting for your ceremony and reception. Your photos will look classy and timeless – nature never goes out of style. Whether you choose a place of worship, a historic home, a country club or even your own backyard as your wedding venue, it’s almost guaranteed to be in full bloom for your big day. Mother Nature will do you a solid and deck out your venue in vibrant greens, pastel blossoms, and bright florals, before you’ve spent any money on decorations. Your spring wedding ideas don’t have to be huge statement themes or expensive decorations. If you prefer to give a subtle nod to the season, try mixing pretty spring motifs into the small details. Your wedding stationery is crying out for a cute floral border or butterfly decoration to celebrate the beauty of springtime. You could even DIY some envelope liners for your invitations in a matching color palette. Follow my tutorial and impress your guests with this luxe touch. 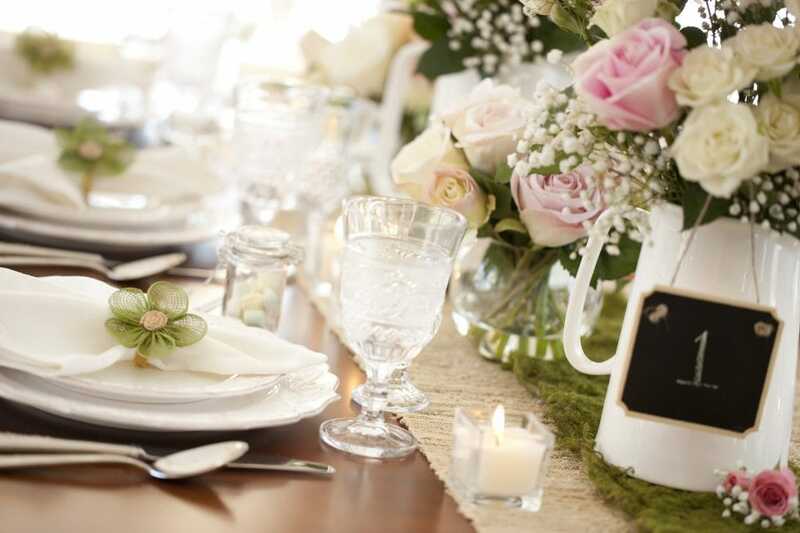 A wedding reception just wouldn’t look the same without table centerpieces to tie your springtime theme together. It’s the perfect opportunity to add your colors and bring more greenery into the room. Succulents and terrariums are very much on trend at the moment. These sweet little plants are a modern and quirky alternative to traditional bouquet centerpieces. Try out a fun wedding DIY project with an assortment of succulent plants nestled on colored sand inside glass containers. You can layer up different shades of sand to match your theme, like the display examples at ColoredSand.net, to create a striking design. Not only do they look great, they also make the perfect take home gift for a few special guests. The first thing that comes into most people’s heads when they think of spring wedding ideas is pastels, pastels, pastels. It’s a color scheme that can work for everything from your bridesmaid dresses to the cake decoration, from your bouquet to your mother-in-law’s hat. If you’ve always dreamed of a pretty pastel wedding, this is the season to do it. But if you don’t feel drawn to these shades, there’s plenty of other seasonal colors to choose from. Spring is bursting with flowers in bright and vibrant tones of yellow, purple and pink, not just blushing pinks and powder blues. The delicious fruit that arrives in spring can become your inspiration if rich jewel tones are more your style. A signature cocktail to serve to your guests after the ceremony is surely one of the spring wedding ideas that will be most popular. Choosing a special drink is a thoughtful touch for your guests. Plus, it’s something that you can make again and again whenever you want to reminisce about your wedding day. With the selection of seasonal fruits on offer in spring, you’ll be spoiled for choice with drinks options. How about a twist on a classic with a berry-spiked gin and tonic, or this refreshing watermelon smash cocktail with fresh mint. Mediocre wedding food will be quickly forgotten, but a delicious dinner can lift your wedding to another level. Your guests have probably seen enough shrimp cocktail appetizers and cupcakes to last a lifetime. Surprise them with a unique menu that celebrates the produce of the season. Spring is the best time for rhubarb, figs, apricots, blueberries, cherries and so much more. If you want to bring spring florals into every aspect of your wedding day, why not try decorating the plates with edible flowers as well. We can’t deny it, a wedding in spring doesn’t give you guaranteed perfect weather. Even if a rain shower on your wedding day is good luck, it’s smart to be prepared with some quirky, weather-friendly accessories. Rather than spend the morning of your wedding rushing to the nearest store for some emergency rain ponchos, plan ahead and make sure you stay stylish whatever the weather. Pop some bright rain boots under your dress or drape a colorful mac over your shoulders if the weather takes a turn. Arm your bridesmaids with decorative parasols for your photo session. They’re pretty and practical at the same time, what’s not to like! Here’s another weather-related tip that is the secret to a stress-free outdoor party. Provide your guests with complimentary extras to make their evening more comfortable. If your wedding location is in a hot and humid area, put some miniature bug sprays in a basket for your guests to use. Give our cozy blankets with night falls to stave off any spring chills. And finally, our top tip for a wedding at any time of year, have a stash of flip flops for any ladies in high heels to change into – keep them dancing all night long! There’s no theme more traditional, classy and timeless for a wedding in spring than florals. Make sure you hit the right notes with seasonal flowers, it’ll be better for your budget and the fresh bouquets you choose will look amazing. Hyacinths, magnolias and irises are just a few of the seasonal spring blooms you can choose for your decoration. For bold spring wedding ideas using flowers, you could create a large floral backdrop for your vows or photos. A classic choice is to hang wreaths and garlands around the venue. Giving your guests flower boutonnieres is a simple way to tie in a floral theme too. Your bridesmaids will be indispensable to you in the run-up to your wedding and on the day itself. Make sure they feel comfortable, pretty, and that they enjoy the day as much as you. Show you appreciate your girl squad by giving them handmade flower wreaths to wear. Your florist may be able to make these along with your bouquets, or you can DIY them with some simple materials. A seasonal crown of flowers will look beautiful on every girl and your bridal party photos will pop with color. Embrace the iconic colors and textures of spring blossom for your wedding. For years to come, the first burst of flowers on the trees will remind you of your happiest day. Using blossom as decoration, whether matching a pastel theme or complimenting bright colors, is a perfect accent to a spring wedding. Ideas for how to use blossom can be bold, like decorating doorways and tables with branches adorned with flowers. A more subtle option could be to scatter petals down the aisle for a dreamy wedding entrance. Now, this last spring wedding idea comes a little out of left field. Spring may mean flowers, fruits and pastel shades to you, but for your other half, springtime may signify something a little different. It’s the start of baseball season! We’re not necessarily suggesting a whole baseball themed wedding, but if the sport is a big part of you and your family’s life, why not celebrate that? A baseball-themed groom’s cake can be a fun nod to the sport without going overboard. If you want a fun and memorable send-off, you could throw on a pair of Mr & Mrs baseball jerseys as you make your way to the car at the end of the evening. Weddings should be about showing your passion and personality, whatever it is. We hope you felt inspired by these spring wedding ideas. Whatever your style, find the flowers, food, and colors of the season that make you feel excited about your wedding day. If you’re looking for more inspiration to make your wedding day beautiful, check out these decoration ideas and craft tips on the blog.